Designed to bring the outdoors inside, FEELC’s skylights and floor to ceiling windows and doors invite observation of the natural areas and gardens from inside the building. Natural objects for study and exploration occupy each classroom, the common areas and hallway, the outside is never far from the inside at FEELC. Children dash or are carried inside eager to greet classmates, teachers and friends and learn what this day will bring. Child driven lessons about math, science, art and dance mean every day is as different as the building, whose décor changes in response to child interests and explorations. The foyer boasts a bed springs made into a “quilt” by students, hanging plants and sprouting seedlings decorate the reception ceilings, counters and windows, and every surface welcomes tactile, visual and auditory experiences. The art designed by students is displayed to all students to share their learning and achievements. Wide windows and glass doors aside, nature is made welcome indoor at every opportunity. Seedlings sprout in windows and ‘catch and releases” caterpillars eat leaves in recycled jar containers. Different types of bark fill one learning center, rocks of every description spill from another. A container with dirt alive with worms, grubs and beetles invites hands-on exploration and study. Indoors or out, FEELC teaches respect for the natural world, wonder at its variety and care giving for its inhabitants. Every classroom’s recycled sweater box “learning centers” invite child-led exploration designed to foster physical, social, cognitive, emotional and self-help skill development. Items change as frequently as the children’s interests. A fallen bird’s nest leads to stories, songs and poetry about birds, babies and flying. Floating empty yogurt cups prompts a discussion and about sailing, swimming and water quality. A captured lady bug “poses” for drawings before its release at day’s end. Using discarded and found objects helps FEELC stimulate creativity, keep costs low and fosters sustainable thinking at the earliest ages. Constantly evolving and inviting exploration, FEELC’s building and its contents reflect the dynamic minds that inhabit it. Children can watch the birds while sitting on a window seat, wide hallways are filled with activity centers inviting small groups of children to learn and explore, all classroom doors lead to an inviting outdoor learning environment. In our front lobby we have a science and nature nook. This area is filled with natural elements that have been found on walks by children. Our science teacher works with the local environmental groups to enhance this area. Bird nests, rotting logs and live insects populate class learning centers today, but new items will soon take their place. Our art closet is filled with recycled materials and many items found in nature. Children think creatively and create master pieces out of free materials. In the kitchen, children consult with the chef on their homegrown salad harvest. How will it be served? How much needs to be harvested to feed their classmates? 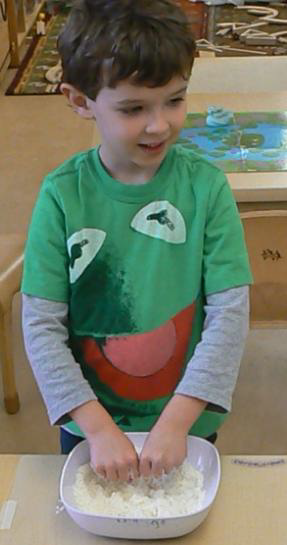 A lively math lesson, punctuated with chatter and laughter, produces answers. Blink and you may miss it. FEELC’s building adapts with its inhabitants minds. 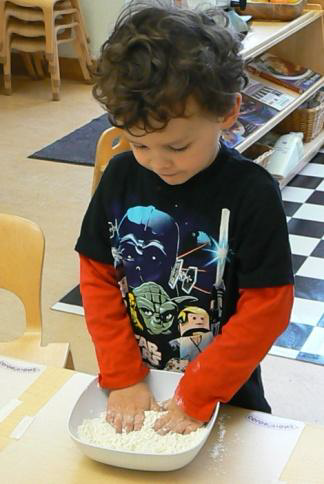 Constant stimulation to learn, create and share with classmates, parents and teachers create an ever-changing interior. Fresh opportunities to explore and experience stimulate curiosity and prompt new questions to spur child-led learning. Daily and weekly notes and photos recording each child’s interests and activities help FEELC teachers track learning curves. The data is shared with parents and other teachers to help with overall planning and collaboration designed to complement child-driven learning while organizing classroom and school wide collaboration. Documentation takes time, but also saves it over the long-term. By customizing each child’s learning experience in concert with their classmates, children learn cooperation and collaboration. The organization benefits by planning ahead for expenditures that can be shared or brainstorming ways to find free resources to support lessons and activities. To re-spark interest in our bakery investigation after the holidays, we put bowls of flour out on the tables for the children to explore. 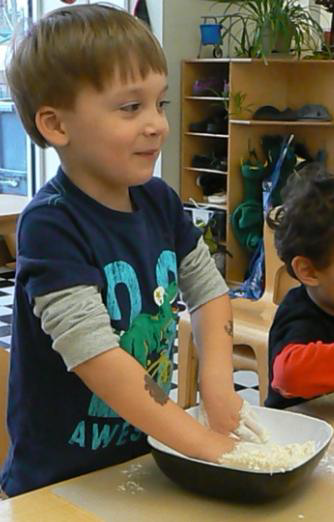 After a while exploring the dry flour, we added pipettes with water. This simple activity covers many domains of development. 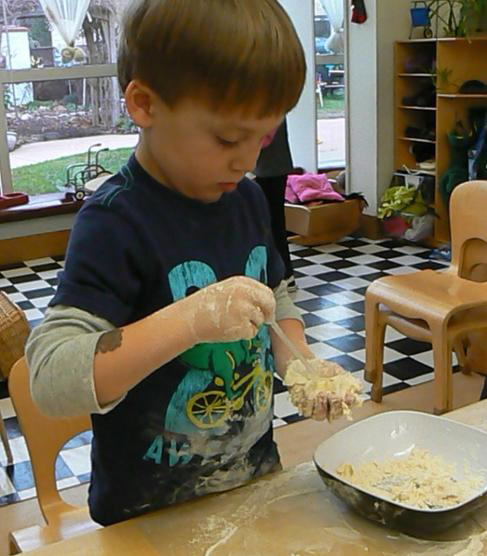 The children are getting a sensory experience, feeling the dry flour, and then the sticky dough. A cognitive experience, thinking about the nature of these two materials and what happens when you mix them. 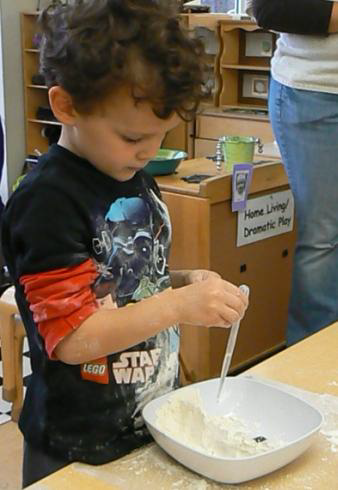 A fine motor experience, pinching the pipette to add water to the flour. 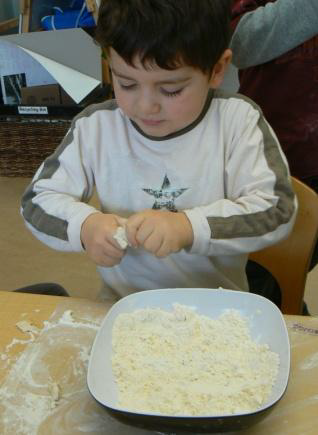 A language experience, expressing how the flour and dough felt and what they thought about it. And these are just a few! This afternoon Avrie observed a bird on top of a light on the bike playground. Slowly, other Villagers began to notice the bird as well. A second bird was observed flying back and forth to the light as well. Ms.Sara wrote down some of our observations of the birds. Avrie – I seen these birds doing something in a nest. They might need a little shade. I saw two birds. The dad is going back and forth to look for worms or pine straw for the mama. She might be sorting things out. She might be having babies. Megan – I saw the mama spread her wings. Ella – I see that it’s sitting down. I think it just laid eggs, and is sitting on the eggs. At 1:11 we observed that the bird that had been in the nest was not there. Soon, one of the birds returned with a “pine needle” (Ella) in its beak. It sat near the nest and looked around. We are not sure why the bird on the nest left or if it will come back. Perhaps a playground is too noisy for a bird family? We will continue to observe and see if the birds return tomorrow.